Born in 1955, Benny Ration has been smithing silver since age eleven. His specialty is three-dimensional figures, often including hand-fabricated holloware kachinas made into pins, pendants and necklaces and shadowbox pendants with cut-outs. He is particularly adept in "saw and file work" which he often uses to sculpt the edges of his pendants. 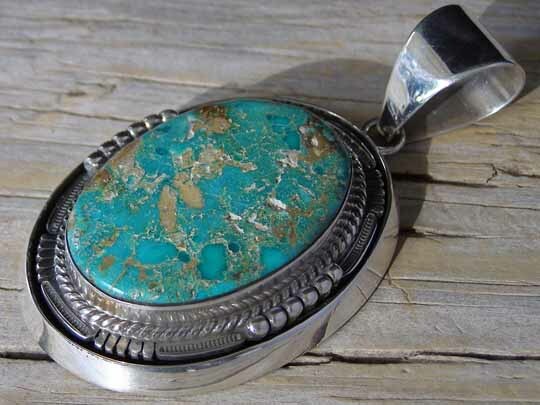 Bennie Ration works with the best natural Royston turquoise that can be found and we love offering his very best pieces with the finest stones. This gorgeous stone of natural, untreated Royston turquoise is set in a smooth bezel wrapped with twist wire. The stone is polished to glassy smoothness and Bennie decorated the pendant's border with saw and file work and rows of raindrops. This pendant was then inset within a larger medallion with beveled edge. Stone: 1 7/16" x 1 1/16"
Dimensions of pendant (excluding jump ring & bale): 2" x 1 9/16"
Total hang (including bale): 3"